Liverpool are in a title race. There are some that want to play that fact down, that want to suggest the Reds will fade away soon despite the evidence to the contrary. Yes we’re six points behind Chelsea, but they’ve got to come to Anfield and off the seventeen games we’ve played ten have been away from home and only seven at our place. The Etihad and Old Trafford are the only genuinely tricky grounds we’ve still got to go to. 7 – This will be the 7th Premier League Merseyside derby played on a Monday & Everton have only lost 1 of the previous 6 (W3 D2 L1). Happy. Everton knew that going into the game. Our Blue brethren care more about derbies than us anyway, probably because they haven’t won one in thirteen attempts. But this meant a little bit more because they wanted to de-rail our season and leave us nine points off the top at Christmas. It was vital that we get three points on the board to keep the pace with Chelsea as we head into the manic festive period. So how did the game go? What were the main talking points? Everton started brightly. Having got off to a slow beginning against Arsenal and been widely criticised for it, Ronald Koeman knew his side could afford to do the same thing again or else this Liverpool side would bury them before they even knew what was going on. They were 2-0 down by half-time at Anfield in the last derby and neither the players nor the fans would accept that at Goodison Park. I don’t think anyone was surprised by how the Blues started, except maybe our players. We looked out of sorts for the first twenty minutes or so. It was bad enough that the Toffees started at such a pace, yet we didn’t help ourselves with a series of sloppy passes that suggested that we hadn’t found our rhythm. James Milner was one of the worst culprits, though he wasn’t alone. Any time it seemed as though we might be able to get into the final third and do something we overhit the ball or players ran into a different position that their team-mate was expecting and the move disappointingly broke down. There’s no question that, for the opening half an hour or so, Everton were winning the battle. They had proven that they could stand toe-to-toe with a Liverpool side that had started to look like it was finding a bit of form again at The Riverside during the week. If we know one thing about Jürgen Klopp’s Reds, though, it’s that they are supremely fit. They’ve been doing double and triple sessions since pre-season to get themselves as ready for the battle as possible. Everton might have started well but it was clear that they couldn’t keep it up. Every 50/50 here is turning into a 90/10 in favour of Everton. Not a big fan of this. There was also an element of fortune about their play. I think it’s weak to blame anything on luck, but every 50/50 seemed to drop their way. We couldn’t stamp our authority on the game and the referee seemed to want to prove his impartiality by giving several niggly fouls as free-kicks, breaking up the flow of the match. Despite recent criticism and the absence of Joel Matip, the defence coped well with Everton’s dominance. They controlled the match but they very rarely threatened and Ragnar Klavan could have been Father Christmas with a bagful of Romelu Lukaku, such was the manner in which he nullified the forward’s threat. After the half-hour mark things started to shift. Liverpool began to get into the game and Everton’s legs began to slow. It quickly became clear that they’d blown themselves out. The Blue storm subsided and our superior fitness combined with our enduring class began to show through. We didn’t threaten much either, but what we did do was take control of the play and limit Everton’s football to feeding off scraps. From thirty minutes on it only really seemed like there would be one winner and that continued in the second-half; albeit after another ten minutes or so of the Blues putting everything they had into it. They’d won the battle, we were going to win the war. Everton haven’t won a derby in thirteen attempts. Roberto Martinez didn’t win one during his time at the club, with his last attempt resulting in that 4-0 mauling at Anfield. It is in part, perhaps, because they have allowed their emotion to get the better of them and felt as though they needed to make the games about blood and thunder; anger and bitterness; hatred and jealousy. They’ve tried to drag Liverpool down to their level and it hasn’t worked. It’s no coincidence that they were at their best last night when they tried to play football and control the match. once every few years Liverpool reminds Everton of their place in the universe. and every other derby is god-awful. They didn’t have the legs, the fitness or the energy to do that for the whole ninety, however. It was clear that Liverpool were taking back control so they needed to resort to their old methods of crunching into tackles and trying to prove that they’re ‘fighters’. The Goodison Park crowd, apart from loving a ‘booooo’ more than actually cheering on their team, love to see their players crash into someone in red. It’s easy to get swept along in the emotion of the occasion when a big tackle gets a cheer from the crowd. As always when you get swept along in a sea of emotion, though, things can go too far. They turned it into a scrap and, to an extent, that’s fair enough. After all, Liverpool were evidently the superior team and Everton didn’t have any answer. Yet when things spill over from scrapping into losing your head it becomes a tricky thing to keep hold of. Sky tried to suggest that Divock Origi and Funes Mori are ‘old enemies’ because of what happened at Anfield, conveniently forgetting that what happened was the Everton player threw in a coward’s tackle on the Belgian that nearly ended his season before walking off the pitch kissing his badge. Lets’ not pull punches here, Ross Barkley’s tackle on Jordan Henderson was an absolute disgrace. If Henderson’s foot was planted that’s a break and he’s probably out for the season. The Liverpool captain was lucky to get away with little more than some bruising on his ankle, but not as lucky as Barkley who should have been shown a straight red and only got booked. I’m not sure whether Mike Dean missed it or bottle it but the linesman was looking straight at it and said nothing. Koeman tried to deflect by saying that Lovren should have been shown a second yellow card, but Everton should have been down to ten men. The Evertonians in the crowd might have been cheering and screaming support for the only Scouser in either line-up but if they were they should be ashamed of themselves, just like they should be ashamed if they sang ‘Always the victim’; a song that is sung by other supporters as reference to Hillsborough. The Bluenoses will tell you they sang it about Heysel – and the ‘pushing’ mime they did is certainly indicative of that – but they should know better. They’ve always been brilliant over the 96 and that sort of behaviour is beneath them as a fanbase and should be pointed out. 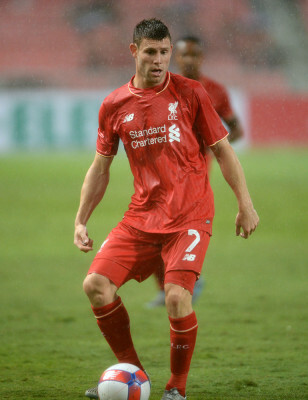 No doubt Henderson has grown as a player and a Captain. His comments on Barkley’s tackle oozed class. #LFC. As disappointed as I was with Barkley’s tackle and the Evertonian singing I was absolutely blown away by Henderson’s response when he was asked about it after the match. Sky, always looking for controversy, brought up the tackle and the Liverpool captain brushed it aside. “Ross is a good lad”, he said. Perhaps he might not have been so forgiving if he’d had his leg broken and doubtless the win made things seem better, but it was a very mature interview and Liverpool supporters who still don’t think he’s captain material might finally be able to get over their small-mindedness on the issue. He’s top drawer. That was the last time the players will take to the pitch until after Christmas, so what a perfect way to go into the holidays. Not only did we beat the Ev in their own ground but we did so with a stoppage time winner after controlling three-quarters of the game. Ronald Koeman might have wanted to play the defeat down and suggest that Everton didn’t deserve to lose but I’m not sure he was even fooling himself. He knows he’s got a huge job on his hands and I’m not sure it’s going to be solved by giving the likes of 36-year-old Gareth Barry a new contract. I don’t care about Everton, though. They can disappear into the ether as far as I’m concerned. All I’m bothered about is the mighty Reds and what we do this season. Chelsea might well be way out ahead of everyone at the top of the Premier League but the most important thing is to be in the mix at Christmas time. six points is nothing when you consider the teams that have been reeled in in the past. This Liverpool side is involved in a title race and a win over our neighbours is the perfect aperitif heading into the festive fixtures. It will be a very Merry Christmas indeed.